This page contains pictures and information about Bee Flies in Tribe Exoprosopini that we found in the Brisbane area, Queensland, Australia. In this Exoprosopini tribe, the beeflies have their wing vein Rs forks very close to cross vein r-m. They are large beeflies. 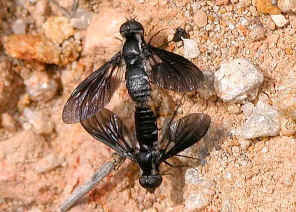 They have stout body comparing with beeflies in other subfamilies. Their wings usually have hyaline and black patterns. Their body has contrasting stripes or brilliant black scales. Exoprosopini beeflies usually land on sandy floor or low plants on sandy soil. They are active under full sun. They will fly away if disturbed, but return to the same spot a short while later. 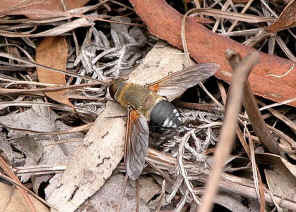 Adult beeflies are nectar feeders. Females also feed on pollen for the development of eggs, i.e., they are the pollinators. Some species of Exoprosopini have the hilltop gathering habit. Sometimes a number of male can be found near the summit of isolated hilltops. 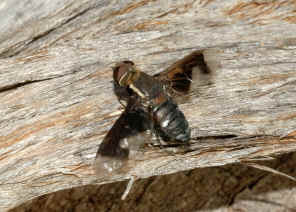 Most of the Exoprosopini species have their larvae parasite on predatory and parasitic, ground-nesting wasps, such as Sphecidae, Pompilidae, Tiphiidae and Scoliidae. Some species extend to other ground-nesting insects. 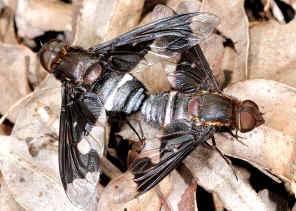 Beeflies in genus Ligyra is large in size and have stout body. Their wings are usually hyaline and some with dot on wing vein cross. There are two i-r crossvein. The second i-r crossvein between R2+3 and R4. 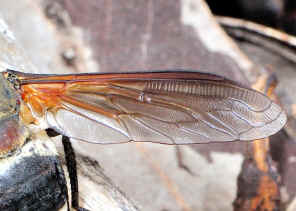 This fly is large with orange-brown thorax. 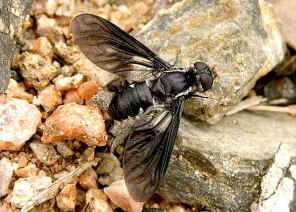 Its abdomen is shiny-black with a ring between thorax and abdomen. 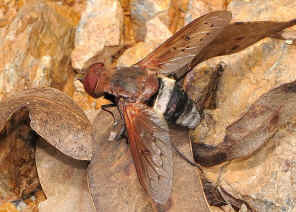 There are some white pattern at the end of its abdomen. They are quite common in Brisbane bush. 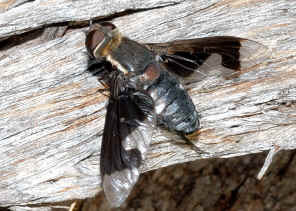 More information and pictures of this Beefly can be found in here. Pictures taken in Karawatha Forest during mid summer. 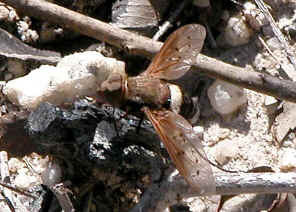 The Bee fly has dark fuscous abdomen cross by a wide band of pale yellowish hairs, and the brownish wings marked with eight small dark spots at the crossing-points of veins. Please also check this page for more information. Pictures taken in Karawatha Forest during early and mid summer. Found them quite a few time in Rocky Circuit on the sandy footpath. Please check this page for more information. 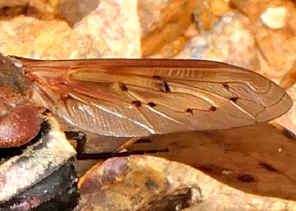 Beeflies in genus Balaana is medium in size. They are dark brown to black in colours. 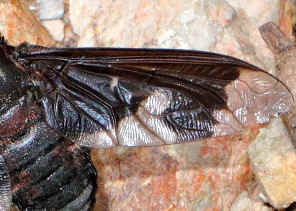 Their wings are black-patterned. There is only one i-r crossvein between R2+3 and R4. We saw a few of those female resting on sandy path on hill top in Anstead Forest on Nov 2009. They are dark brown to black in colours. 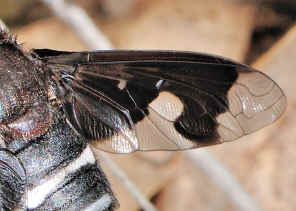 Their wings are black-patterned. Please check this page form more information. 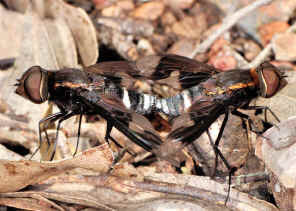 We found this mating pair in Anstead Forest on Oct 2010. They are dark brown to black in colours. 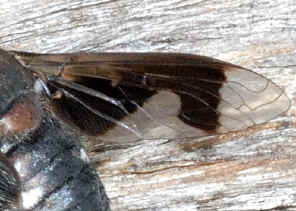 Their wings are black-patterned. Please check this page for more infromation. 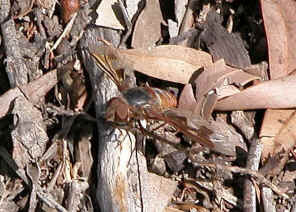 Found a number of them in Karawatha Forest Rocky Circuit near the hill top on sandy footpath Nov 2008. They showed very strong territorial behaviour. 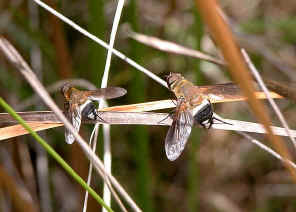 After disturbed, they always flied back to the same spot and rest. 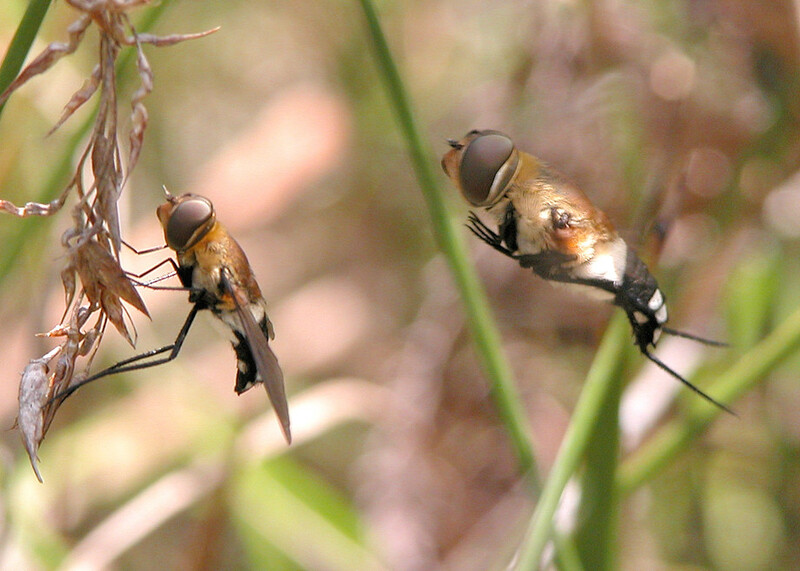 When other flies came close, they always driven them away. Please click on here for more information. 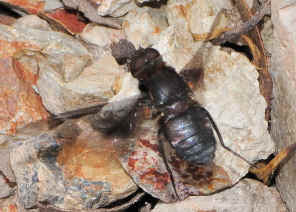 This is a medium size black shiny beefly. 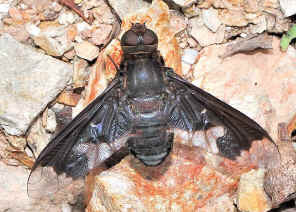 Its wings are relatively short tinted with dark colour, with the hyaline spot near the wing base. Eyes and head are dark brown in colour. 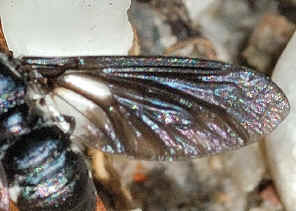 Thorax and abdomen are black and extremely shiny. There are the short white hairs along each side of thorax. There are the small white patches on each side of abdomen. Check this page for more details. 5. Life history of Ligyra satyrus (Diptera: Bombyliidae) - Yeates DK, Logan D, Lambkin CL. Australian Journal of Entomology. 1999. 38: 300-304. 6. A review of the Australian species of the genus Ligyra Newman (Hyperlonia Olim) (Bombyliidae : Diptera) - SJ Paramonov, 1967. Last updated: December 01, 2012.